Calum Scott is an excellent, pop singer/songwriter from England who is quickly building an international following. He first became known in 2015, when he appeared on Britain’s Got Talent TV show. He made a strong impression by singing a unique, heartfelt version of Robyn’s hit “Dancing On My Own,” which later became a hit single for him. The success of his TV appearance and the single “Dancing On My Own” led to Scott securing a label deal with Capitol Records in 2016, and he has just released his debut album, called Only Human. Remarkably, the album has quickly become a top seller in many countries on different continents. Only Human debuted at #1 on the iTunes album chart in Australia, Hong Kong, the Philippines, Indonesia, Thailand and Taiwan, and Top 5 in the United Kingdom, Canada, Denmark, Mexico, Vietnam, Israel, Switzerland, New Zealand and Brazil. Notably, Scott co-wrote most of the songs on his album, including the single, “You Are The Reason.” This song is a beautiful ballad with a classic pop melody, that is comparable to hit ballads by Ed Sheeran, Sam Smith or Josh Groban. This song caught the attention of hit artist Leona Lewis, and it led to the recording of a second version of this song, a duet between Scott and Lewis. Only Human was mostly produced in the U.K. by hit writer/producer Fraser T. Smith, who is known for working with Adele, Ellie Goulding and Sam Smith. Other cuts on this album were co-written & produced in the U.S. by Jayson DeZuzio (Imagine Dragons, Jason Derulo) and Oak Felder (Demi Lovato, Alessia Cara). Scott, who is 29, was born in Yorkshire, England, and he did not get an early start in the music business. Early on, he won a local talent competition and played in a tribute band, but he was largely unknown until he performed on Britain’s Got Talent when he was 26. After becoming famous in the U.K., Scott has been open about being a gay man, and has been supportive of the LGBT community. He hopes that his songs can help inspire people to become more confident and embrace who they are, and create an atmosphere of more love and less fear. 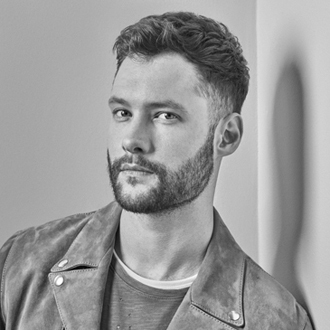 We are pleased to do this new Q&A interview with Calum Scott. He discusses his breakthrough in the music business, and talks about his songwriting for his debut album, Only Human. DK: You got your big break by singing on Britain’s Got Talent show. How did you decide to perform on the show? Calum Scott: If I’m honest, it was kudos to my sister (Jade Scott). It was her idea [for us to audition for the show]. By this point, I had joined a tribute band and I wanted to get some live experience with my music, and I started to learn to write songs. And she was like, “We should really go for the show, it might be cool…we’ll get some life experience.” But I don’t think either of us was quite expecting what happened next. It was one of the best and worst days of my life (because he was selected but his sister wasn’t). It was great as a singer, but terrible as a big brother. DK: You picked Robyn’s song “Dancing On My Own” to sing on the show and it later became a hit for you. How did you decide to sing “Dancing On My Own” and turn it into a ballad? Scott: Well you know, I’m a big fan of Robyn. I love her songs and “Dancing On My Own” was one of my favorites by her. I loved the song…I very much related to the lyrics. You know, as a gay man, I always fall in love with the straight guy. And I always watch the other person get into a relationship with somebody else. And so on that level, I very much related to the lyrics, so I’d already created a connection with the song. And when I slowed the version down, I think it just completely changed the way that we hear the song. It became a heartbreaking song about unrequited love. I also wanted to make sure that the lyrics reflected me as a person, because I wanted the lyric to relate to my own life. DK: On your new album, you co-wrote most of the songs. Did you focus more on your songwriting when you started working on your album? Scott: Yeah, before the [Britain’s Got Talent] show, I hadn’t really had any writing experience. I knew that singing and performing was something I wanted to do for the rest of my life, but I was unsure about songwriting. I’d never been a songwriter before. I definitely had experience of writing original material in terms of writing at school and I was pretty good at it. I had a creative mind and a big imagination. So I was good at writing at school and poetry, but never songs. And I always admired songwriters, because they wrote very real stories. But it was hard to think of being able to articulate that in a song. Then my manager, Luke Williams, put me into various songwriting sessions, to see if that was something I could do. And very quickly, I became enamored by songwriting. I felt that it was something I was capable of doing, if I was to share my own stories…to share my own adventures and heartbreak and love and romance. I think songwriting then became a therapy for me. Very early into my songwriting, I wrote “If Our Love Is Wrong” with two talented songwriters (Philip Plested & KIN) in London. And that became a turning point for me as a person and as an artist. It meant that I could write more openly, write more honestly, and open the door for me to write songs that would hopefully inspire people to be brave and to be courageous like I was. But it took me so long to do. Whereas I’m hoping people will listen to this album and be confident and happy at an earlier stage of their life, to not live in fear. Songwriting suddenly became something that I wanted to do all the time. I wrote 70 songs for this album, so I definitely fell in love with songwriting. DK: One of my favorite songs on your album is “You Are The Reason.” How did you co-write this song? Scott: Well, the song actually started about anxiety…relationship anxiety, and not knowing exactly where it came from. So the song actually started out as “without a reason.” And the moment that we realized, that the anxiety you go through with a partner or with any relationship—family, friends, siblings, kids, grandparents—whatever you go through in your life, the fundamental love that you feel for the special people in your life can get you through anything. And that love conquers all…it’s a really important, very timely message to share with the world. I just think there was something beautiful about that, and the song evolved as it does in these (writing) sessions, and became “You Are The Reason.” I think music is a universally understood language, and to send a message around the world that love conquers all, is very powerful and something that everybody can relate to. You know, my reason was my late grandma; she was very involved with my upbringing. I feel like I can thank my grandma for all the traits I have today. And the beautiful thing about the way that this song is written, is that it lends itself for people to create their own reason, and to look at this song and adapt it to their own story. I think that’s the beautiful thing about songwriting…to create songs where people can create their soundtrack to their life with. DK: You’ve also recorded a duet version of “You Are The Reason” with Leona Lewis. How did you connect with her? Scott: Meeting Leona Lewis was awesome. We were introduced to each other by (hit songwriter) Diane Warren, who’s prolific in songwriting. Leona and I started emailing, and we hit it off straight away. She sent me a song that she wrote with Diane, and I sent her some of my songs. Then she sent me a version of “You Are The Reason” (that she recorded) and I was like picking my jaw up from the floor; it was just so incredible. She’s got such a beautiful voice. [We decided to record a duet] in London and then a couple weeks ago we filmed the video. When I first wrote the song, I never thought it would be a duet. And then to write this song and have a superstar like Leona singing it, it’s a very surreal experience. DK: Besides the songs we’ve discussed, what are your other favorite songs on the album? Scott: Oh gosh, that’s like asking me to pick my favorite child (laughs). I think “You Are The Reason” has always been the most special to me on the album. But there are other songs on the album like “Won’t Let You Down,” which is a tribute to my sister. It’s a special moment on the album, about being a big brother and no matter how far I am around the world, I’m always going to be there for her. I’m never gonna let her down. There’s another song that people seem to be gravitating to, called “Only You,” which is a tribute to friendship and companionship, and how that can help you out in your darkest times. I know I wouldn’t be anywhere without my best friend, who’s helped me along the way so much, with my sexuality and helping to come to terms with that. And just being a good friend…somebody who’s always there for me. [I also like] “Stop Myself (Only Human).” It’s a song about the desperation of love, and how do you control emotion? The answer is that you can’t…it’s to be embraced. We’re not robots…we’re not pre-programmed to think in a certain way. We just feel. And I think there’s something beautiful about that. Don’t get me wrong, there’s chaos there for sure. But there’s something beautiful about human emotion and that it’s uncontrollable. We all go through human emotion: the highs, the lows, the heartbreak, the love, the romance. And all the jealousy and the bitterness. I think all of it should be rejoiced and celebrated, and it’s relatable, which is 100% the aim of my songwriting, to be relatable. I’m a very normal guy; I still feel like the same guy that started out on this path, and I want to keep writing music that people can relate to. DK: Thank you Calum for doing this interview. Is there anything else that you’d like to mention for this article, that we haven’t talked about yet? Scott: Oh yeah, for sure. This is my debut album—it’s a very honest, genuine album. It’s been a long time coming…my fans have been incredibly patient and loyal. And it feels very surreal to have the album out right now for the world to listen to. For me, this is what I’ve been working so hard on for the past year-and-a-half, and my heart and soul has gone into this. I’ve tried to be as honest as I possibly can, because I do want to inspire people, especially on the LGBT issues. I want to inspire people to be confident and to know that there’s love out there. Also, I genuinely want to thank everybody for their support. It really comes from a very humbling place. I’m very grateful…I count my blessings every day. I’m not one of those guys that’s gone out and go, “Oh well, this is the job now.” For me, everybody I talk to is important and everybody who listens to my music is important to me. I’m very grateful for these opportunities, and hopefully, long may it continue.